Come and join us for another exciting evening of poetry, this time from Robert Seatter. He will be reading to us in The Camden Centre, Tunbridge Wells on Tuesday, November 15th. starting at 8 o’clock. Robert has certainly enjoyed varied experience since leaving Oxford University, where he studied English. He has worked as an EFL teacher in Italy and France, an actor, a journalist, in publishing and broadcasting. He lives in London where he now works for the BBC, as Head of History. 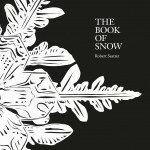 Robert Seatter has this year had published The Book of Snow with Two Rivers Press. Other poetry collections include: Travelling to the Fish Orchards, On the Beach with Chet Baker and Writing King Kong, all from Seren. He has won many awards and nominations for his poetry including National Poetry Competition, London Poetry, Forward Poetry Prize, Tabla, and Housman Poetry Prize. I wanted to describe the arc of a relationship through one image: snow. I then gave these snow-inspired poems to artist Jessica Palmer, who interpreted them in paper cut, collage and collograph. Fascinated by her artistic process, I wrote a parallel sequence of poems exploring the art of her interpretation. These were unified in a stark and powerful, black and white design by graphic designer Sally James. The result is, I hope, a work of connection, definition and revelation.